Geeter: french bread, bacon, and crab! My husband and I frequent a local sandwich shop called Erbert and Gerbert's. They have unusually named sandwiches with delightful stories behind each. Mostly, though, they are just a really good sandwich shop. That being said, sometimes you don't want to pay sandwich shop prices, so I decided I would attempt my hand at one of my favorite sandwiches: The Geeter. 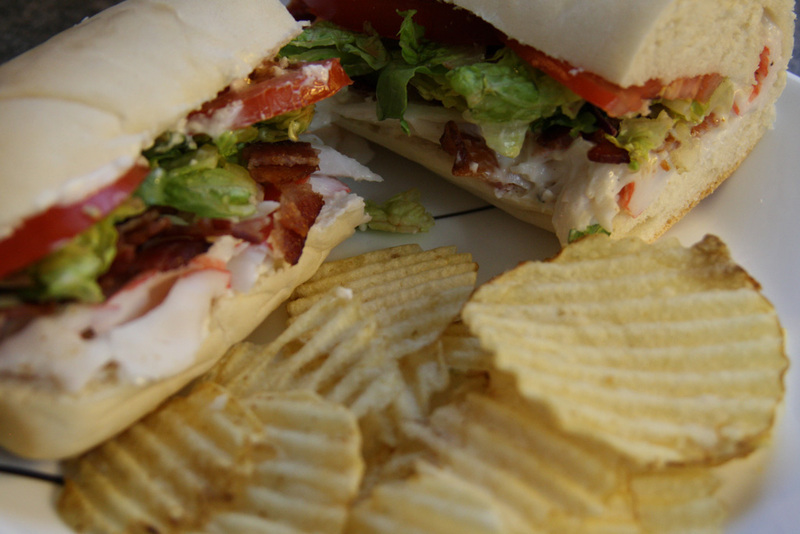 In short, it is a chopped seafood sandwich with bacon, mayo, lettuce, and tomato. It's wonderful! 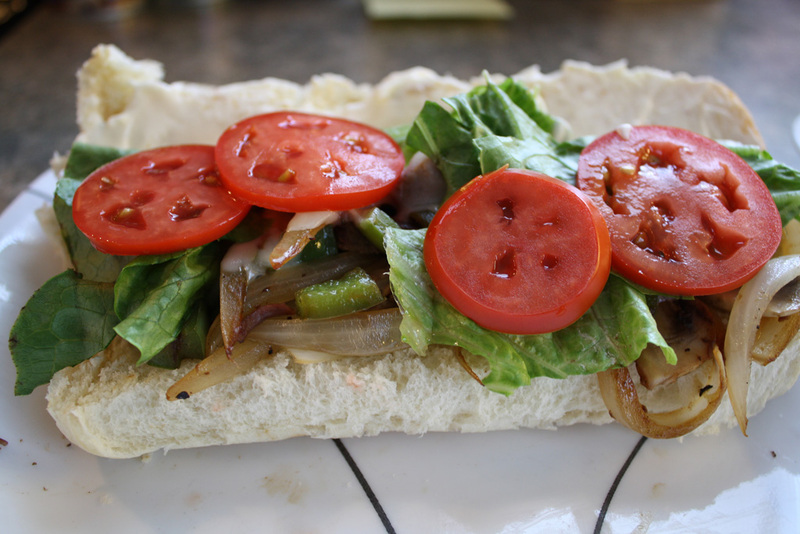 Read more about Geeter: french bread, bacon, and crab! Read more about Taco Braid! Egg Rolls from Scratch; baked, not fried! My mom always used to make egg rolls growing up and they were amazing! Nothing in the restaurants compared to mom's egg rolls. However, she would only make them for special occasions because they were so putzy. One day, she taught me how to make them and I've been experimenting with them ever since. 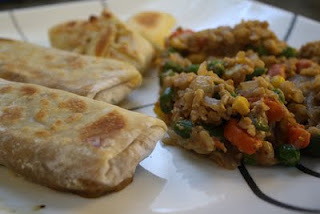 Read more about Egg Rolls from Scratch; baked, not fried! Chicken fajitas with garden fresh green pepper! 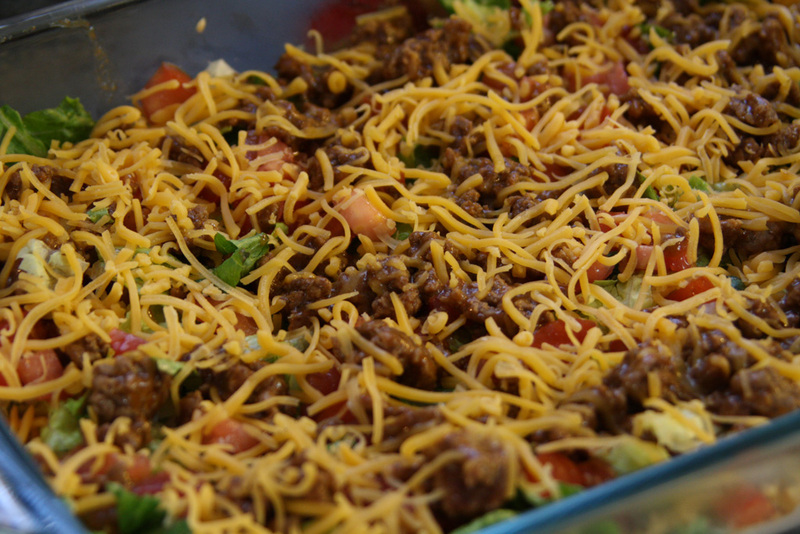 My green bell pepper plants have finally produced large enough peppers for eating, so I came up with some tasty meals that could incorporate my garden fresh peppers. The first one was the steak sandwich. Then, considering my husband's inexplicable love of "Mexican" food and all things wrapped in a tortilla, I decided to make Chicken Fajitas! 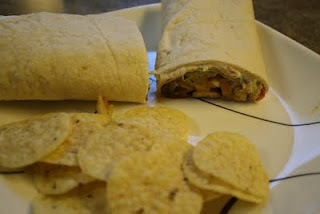 Read more about Chicken fajitas with garden fresh green pepper! After visiting my dad's for dinner the other night, he gave us some leftover steak to take home. My dad makes the most amazing steak I've ever had. Leftover meat poses a small problem (at least for the picky of us): it never tastes quite the same as when it was freshly cooked. Now, my husband would have no issue with just eating the leftover steak and some grilled veggies like we did the first night. 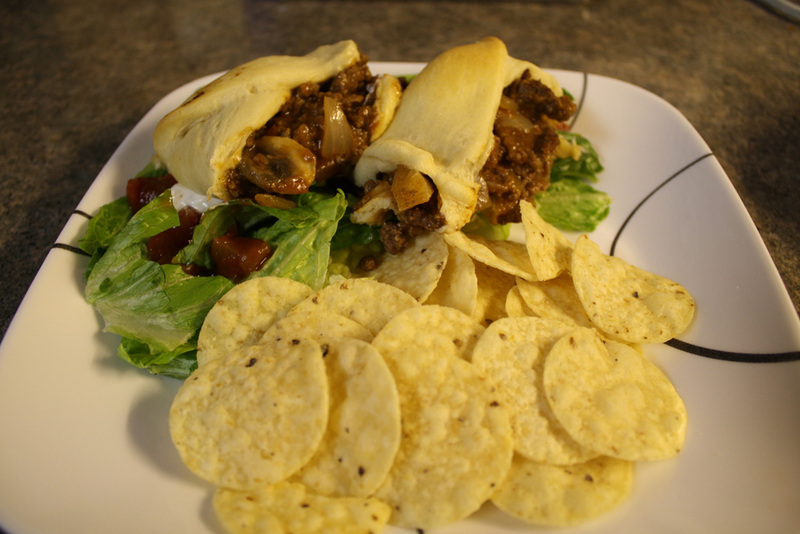 Read more about Steak Sandwiches! 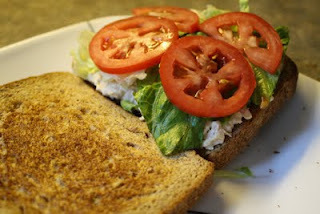 "Gourmet" Tuna Sandwich on a Budget! I grew up with tuna from a can and didn't realize until much, much later in life that there is a such thing as "ahi tuna" and other forms of tuna that do not come out of a can. In fact, these fancy kinds of tuna are served at fancy kinds of restaurants! I remember the first time I went out to eat at a classy restaurant and my mother-in-law ordered tuna. Read more about "Gourmet" Tuna Sandwich on a Budget! 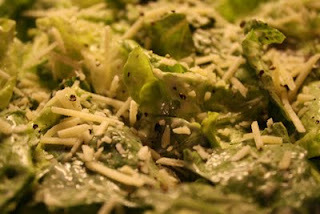 Classic Chicken Casesar Salad (for those hot summer days)! It has been unbearably hot in the great mid-west. Anything about 70, especially if humidity is involved, is too much for me! So I've been trying to come up with ideas that avoid the oven and minimize the use of the stove. Fresh fruits and raw vegetables have been great for snacking on. However, meals are a bit trickier. 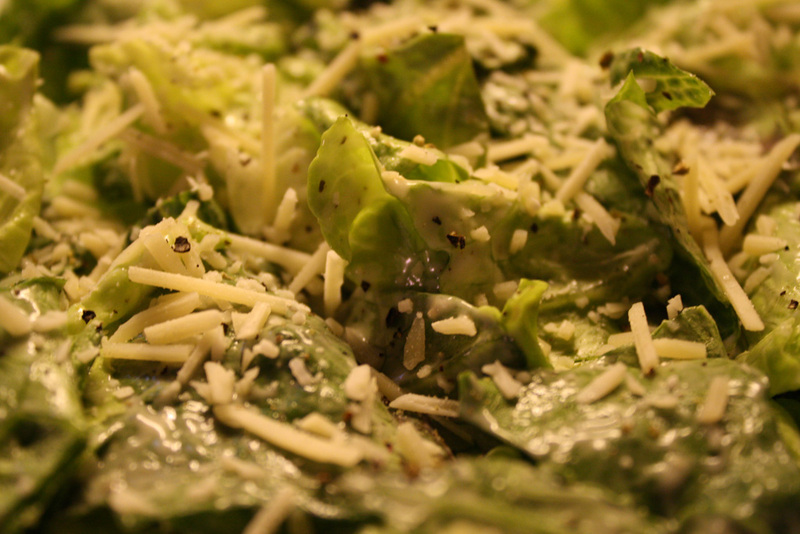 Read more about Classic Chicken Casesar Salad (for those hot summer days)! Gourmet Grilled Cheese with Chunky Tomato Soup! My husband and I love grilled cheese and tomato soup! Usually, we just go for good old American slime cheese on English muffin bread with a nice can of Campbell's condensed tomato bisque soup... but today, we decided to try something a little special. 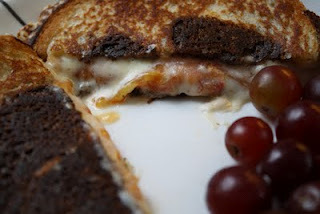 Read more about Gourmet Grilled Cheese with Chunky Tomato Soup!